The heart of the selfish mining cancer is the false notion that rational miners are some sort of central socialist planner. In some ways this argument is understandable, most academics do not understand the difference between profit and revenue and local bureaucrats seek to maximise total revenue percentage as if this matters. Businessmen are not however socialist planners. This flaw is always the heart of why selfish mining is so insidious. 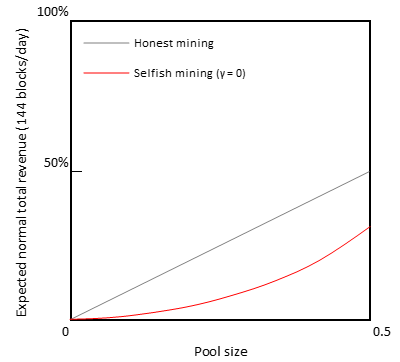 In the selfish mining fallacy, the argument relies on the relative percentage of blocks earned by a particular miner. It does not consider the number of blocks to unit time and their state model is based on a fixed average that does not account for orphans or the simple notion of revenue per unit time. Many simply don’t get this. Again, and again we see technocrats, academics and demagogues oversimplifying, downplaying profit and seeking to apply the physics of rocks to human interactions. Unfortunately for them, none of these holds in the real world. Human interactions are always conducted at a level far too complex to be modelled using simple state tables. That aside, flawed pseudoscience such as the selfish mining cancer are incredibly simple to debunk. Once you get past the ad hominem attacks and typical troll tactics, even my grandmother can understand how asinine such a quack level theory really is. At its simplest, the profit motive is not simply about revenue percentages. Profit is the additional reward for earning and at a certain point more revenue leads to lower profit levels. Any good businessman knows this. Miners who manage to stay in business are by nature shrewd businessmen or businesswomen. This is the competitive nature of bitcoin. It is a meritocracy where the best and the brightest can win. Not the best pseudo-intellectual, the best at competitive business. The best at delivering what the customer needs and requires, in this case better money, a better payment system, better cash. Profit is the reward gained from revenue after costs. All businessmen, and I’ll say businessmen although this incorporates women and everything else that have managed to stay in business have a shrewd and deep understanding of this concept. All successful miners are businessmen. As a miner you have bills to pay. The are fixed costs such as staff and data centres and there are variable costs including network bandwidth and electricity. These costs eat up a large component of revenue. As a miner, you may expect a large net profit in the good times, but the reality is much of this accounts for the risk associated with mining. The current market environment demonstrates such a risk. Many miners have increased their overall hash rate with the expectation of 20k USD level bitcoin earning expectations. Many of these miners will be making large losses right now and several of them could even go out of business. One of the key aspects of selfish mining that is not even touched upon within the initial pseudoscientific paper concerns the number of orphaned blocks. To a simple academic it is possible that they could believe the lie that businesses are there simply to attack one another. It is the typical socialist hogwash that is taught in many Ivy League universities these days. It is generally why I have avoided first-tier universities in the brainwashing that they deliver. Business does not concern itself with just some simple revenue percentages. Any successful business needs to consider profit. The idea of selfish mining (the cancer) is a beggar thy neighbour strategy. This is not something that any rational miner does. In fact, we will demonstrate that this is not even something that an irrational fool would do. The selfish mining cancer would’ve remained a joke if it was not the insidious creeping infection that it has become. Instead of just laughing at the foolishness of the authors, it has been subsumed into the heart of all that is attacking the strength of bitcoin all that is dividing the community. The selfish mining cancer is the power behind core and all the moves to stop scaling bitcoin. The very model used in selfish mining is itself flawed. A Poisson distribution is only valid under the conditions of I.I.D., that is the model must be independent and identically distributed. The selfish mining model is conditional. The selfish miner reacts after the discovery of a block from the honest miner. This is a conditional and not independent scenario. The result is the mathematics used within the model are flawed. An Erlang or negative binomial distribution would give far better results. To correctly analyse the procedure, one would need to create a time censored Bayesian model. I shall not address these in this post as that comes too technical for most readers, but I am releasing the mathematics behind this and they have been peer-reviewed (lots of squiggly lines). A simple explanation is that the model excludes orphans and ignores the time distribution of blocks. We see the distribution using the flawed model from the selfish mining cancer paper in figure 1. Even using the mathematics of the selfish mining cancer, which happens to grossly exaggerate the returns when compared to the correct conditional mathematics we see just how much the selfish miner loses. When the pseudoscientific analysis shows the increase in relative revenue, they are correct. They do however ignore that this is a sleight-of-hand covering up the greater losses suffered by any miner engaging in the strategy. They call a loss a gain. This is a play straight from the 1984 playbook. It is classic doublespeak. In figure 1, we see that there is no point where the selfish miner increases their revenue. The disingenuous argument on how the miner slightly increases their percentage revenue is the heart of the sleight-of-hand. At present, I will not pull apart the mathematics and the flaws in the model but will use their model to show its own inconsistencies. Only once I have completed digging the grave and extracting this cancer will I go into the detail of all the technical flaws and errors in mathematics that riddle this paper and that allowed the cancer to grow within bitcoin. This is not a single post, but this is a long-term extraction of the cancer that has infected the heart and soul of bitcoin. The Selfish Mining cancer is based on a claim that above the threshold mining power of 1/3, a Selfish Miner will claim more than its “…fair share, that is, more than its ratio of the total mining power”. By ‘fair share’ here they mean the Selfish miners proportion of the actual number of blocks that made it into the blockchain rather than the number that should have made it to the blockchain. 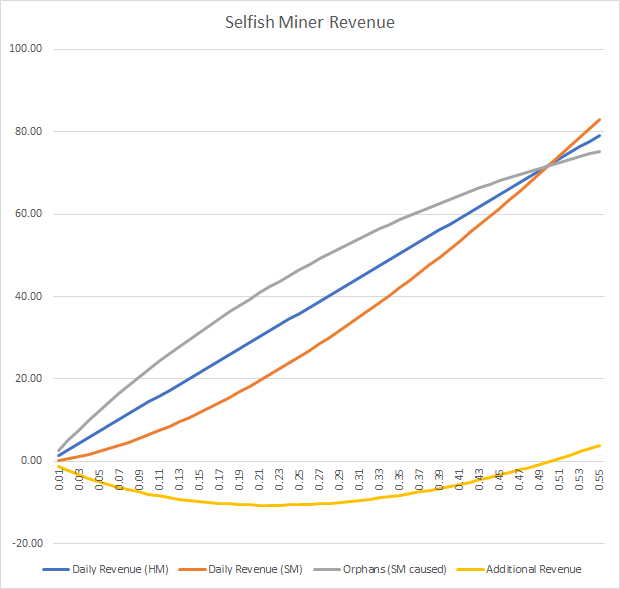 The selfish miner’s share of actual total revenue is 14/46 = 30%. Thus, in this example, SM’s ‘relative revenue’ (30%) is still lower than their mining power (33.3%). Of course, this is only a random example; there are possible outcomes whereby SM fare much better — and indeed whereby they fare much worse — a definitive refutation of E&S on mathematical grounds is being presented in a related paper. In this, we provide a rigorous mathematical treatment of the problems and the flaws with the authors assumptions; the point of this illustrative exercise is to demonstrate a key issue: that the actual revenue earned by the selfish miner is always lower than they would have earned by adopting the honest strategy. In figure 2, we show the expected gross return from a Selfish mining strategy without addressing the flaws in the model. This is the best scenario the selfish miner can hope for, the reality is not even close to being this good, but, we shall start without even having to refute the errors in the model. It is that simple to discredit. We see clearly that the selfish miner only gains additional revenue at the 50% mining hash point. There is no point in addressing this however, for the security of bitcoin is reliant on miners holding less than 50%. It would be self-defeating if a miner with more than 50% of the hash rate decided to selfish mine as they end up with a strategy that is rather defeatist at any point. Before we even get to profit, the key focus of any rational miner, we see the additional orphaning takes a direct toll on the revenue earned by the selfish miner. As has been noted several times, rational miners seek profit. The selfish miner paper/cancer specifically states an attack by rational miners and that the profit motive or rational incentives are broken. In figure 3, we see this is utterly false. Figure 3 is based on a high-end miner earning on the higher end of profitability scale. We have set this at a 7% net profit on earnings before tax (and if we include tax and other costs this is worse for the miner, but we do not even need to go there to discredit the cancerous concept of selfish mining). We see both mean overall profit in blue as well as the strategy gains in red in figure 3. A selfish miner can make a very small profit while selfish mining at between the 45 and 46% level. At this level of hash rate, the honest miner would make far more money as profit above costs. When we look at the comparative gains comparing the expected returns as net profit for the most successful mining organizations we see that the selfish miner needs to have between 51 and 52% of the total hash rate before selfish mining to make more gains than those deploying an honest strategy. If we take the example used within the (cancerous) selfish mining fallacy, that is a mining pool holding 33% of the total hash rate. Ignoring any of the realities of the dynamic nature of mining and making the (toy) assumption of a static mining pool and hash rate overall, we can start to see what the selfish mining strategy really is. 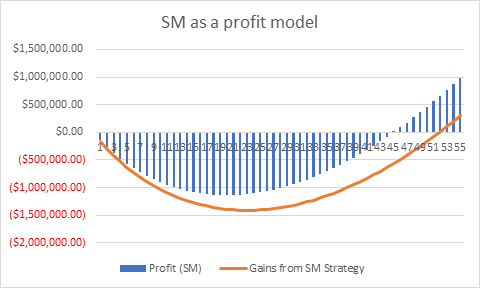 Even taking a net 7% return as profit making our 33% miner one of the more successful miners over all (the majority of miners only return a risk-adjusted net profit between three and 5%). We can start to analyse what the selfish mining strategy means to a rational miner. To a less successful miner the profitability is lower and will not be anywhere is near as good as the proposed returns detailed below. Our 33% mining pool will expect daily revenue when mining by the standard protocol of 47.52 blocks. If that same miner engages in the selfish mining strategy they cause a loss to the network of 56.4 blocks per day that are created on average as additional orphan blocks. The result is that the selfish miner can expect to return 38.61 blocks per day. When you analyse the percentage of orphans we can see that this beggar thy neighbour strategy causes bigger losses to the other pools. For this post we will ignore how simple it is for those honest miners to detect and simply blacklist the dishonest mining pool removing them eternally from being able to earn anything. But again, that is for another day and will become another nail in the coffin of the selfish mining cancer. We are going to not only put this lie to rest but over time to burn it so deep into the memory of people that they will never again forget this lesson. So, remembering the profit comes on top of revenue we can calculate a very simple model of profit before tax. Our 7% miner when bitcoin is trading at $10,000USD each bitcoin in our 12.5 Bitcoin block will earn approximately US$416,000 each day in an honest mining policy and strategy. Comparatively, when we factor the losses into the selfish mining strategy we come up with a loss. To earn fewer blocks, the selfish miner needs to pay more money and costs than the honest miner. They need to manage extra systems and maintain extra software. Even taking this additional cost as being nearly negligible, we know that the cost for the selfish miner will come to the total revenue as an honest mining strategy minus the profit at 7%. Our costs for any each strategy at the 33% level come to around US$5.5 million per day. The expected revenue for the selfish miner has been reduced however to only US$4.7 million from the honest mining strategy US$5.94 million. The result is a daily loss of around US$809,000 per day for the selfish miner. This comes to a figure of US$24.27 million per month that the selfish miner will expect to lose. This is the true argument for the cancer of the selfish mining fallacy. It is a lie mixing revenue and profit in a flimflam designed sleight-of-hand promoted as a pseudoscientific analysis. The argument is a cancer, a lie is the heart of the issue that has corrupted bitcoin since its inception as a cancer in 2013. The heart and soul of the selfish mining argument is that a rational sane miner will burn money, not just insignificant amounts of money but masses of capital to beggar they neighbour. This is particularly crazy when you start to understand that the selfish miner would be able to buy additional hash rate. In buying hash rate and strengthening the network they would be first of all spending less money as well as strengthening the network. In this analysis we haven’t even looked at the price or the effects of market. We have made the completely erroneous assumption as the selfish mining cancer holds that the market would not punish the selfish miner in this attack through a drop in price. The reality of course being that any such attack would lead to a lower price on the bitcoin market if it was successful. The selfish mining strategy would be a joke if it was not the cancer is. This and erroneous pseudoscience has allowed organizations such as Blockstream and members of core to stop scaling bitcoin and to leave it wallowing. This pseudoscience has allowed individuals to attack the concept of bitcoin in such a way that protocols like Ethereum that would have been developed inside bitcoin separated into Alt-coins. All these things have happened because of the selfish mining fallacy and the false strategy of painting bitcoin is having a broken incentive model. These lies end now. In the coming weeks and months, we shall not only show basic flaws within the strategy that is the selfish mining, but detail just how ignorant and erroneous this pseudoscientific paper truly is. We intend to pull apart every aspect of the mathematics, every aspect of the model and every flaw and in this teach people how bitcoin truly works and functions so that no such false model can ever take hold again.